Still watch movies from time to time, but too hard to keep up any movie reviews, as I'm already completely given a handful by writing my entries on Baroque music and National Parks. I think I will try to be as brief as possible in my future movie reviews. Invictus is a movie directed by Clint Eastwood, portraying Nelson Mandela's attempt to unite the races in South Africa following him being elected as the president. South Africa hosting the 1995 Rugby World Cup presents the perfect opportunity and stage for Mandela to do this. 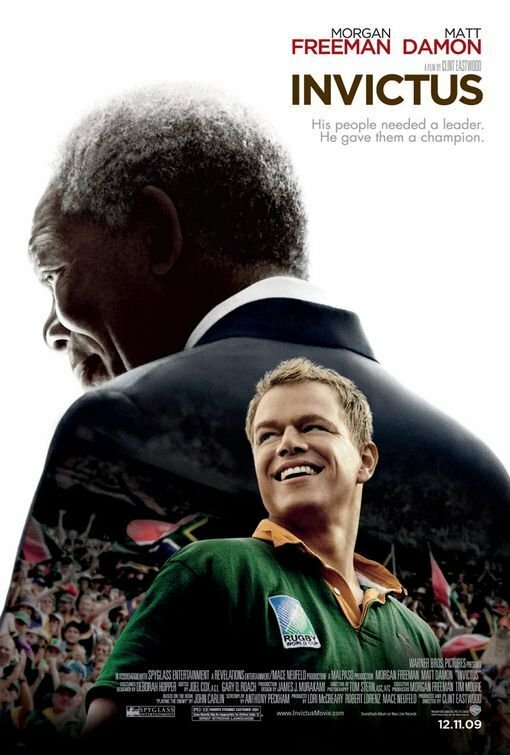 Morgan Freeman stars as Nelson Mandela and Matt Damon stars as François Pienaar, the captain of South Africa's rugby team. Based on a true story, the fairy tale ending makes the movie's outcome predictable. However, this movie is much more than a sports movie. The parts of the movie that were most powerful to me those dealing with how Mandela chooses forgiveness and compassion instead of revenge. Matt Damon's character François Pienaar sums it up the best "I was thinking about how you spend 30 years in a tiny cell and come out ready to forgive the people who put you there....." It truly takes a man of great character to be able to do this. Another great film by Clint Eastwood, who has not really directed a disappointing film.